One resident said the dogs were "frenzied" and she was glad none of the local children were out playing at the time. RESIDENTS OF A small housing estate in Co Kerry have complained to the county dog warden after a pack of hounds killed a fox outside their homes. The incident happened in the Boulia area, near Killarney, last Saturday afternoon. 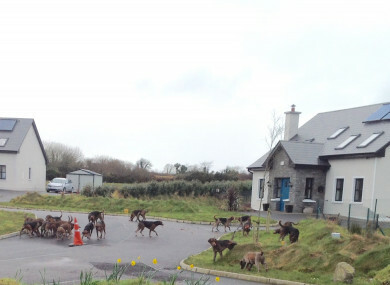 One resident told TheJournal.ie that her husband first heard the dogs barking outside and when they looked out they saw the hounds running into the front gardens of her neighbours’ homes and around the central green of their estate. “Several followed the dog that had the main carcass to the green and others stayed on the grass near the drive with another part of the fox which they were fighting over. Several of the dogs urinated or scent marked around the grass areas. The whole incident was gruesome,” she said. The woman expressed concern that this kind of activity took place on a street where families with small children are living. She said one of her neighbours cleaned up the fox remains that had been left on the street and in another neighbour’s driveway by the dogs. “The dogs had taken the main carcass, but left the tail and entrails,” she said. TheJournal.ie has seen images of the remains that were left by the pack. The woman said it was not clear whether anyone was with the dogs and there was no indication of which group or association they may belong to. She said the land around the houses is occasionally used by hunt groups. She said residents have reported the incident to the county dog warden for investigation. A spokesperson for one of the hunt clubs in Kerry told TheJournal.ie that all four mounted clubs hunt on Sundays so they are unlikely to have had any involvement in this incident. However, they said there are a number of ‘foot packs’, with members who go on foot with the dogs, who may have been responsible. Kerry County Council dog warden Brendan Deane said his investigation into the incident is ongoing but he believes it was a “once off” incident. In a similar incident in Macroom, Co Cork in December, a fox was killed in the front garden of a family home. Independent TD Maureen O’Sullivan recently asked Minister for Agriculture, Food and Marine about the Cork incident. He said a detailed debate was held around the issue of hunting during the passage of the Animal Health and Welfare Act 2013 and “the Dáil voted overwhelmingly to allow the continuation on fox hunting in accordance with an appropriate code of conduct”. The prevalence of a local fox population can be a cause of serious concern to owners of livestock and in particular poultry. However, the act makes it clear that hunting must occur in a lawful fashion, which avoids wilful or unnecessary cruelty such as hunting an animal that has been released in an injured or exhausted condition. The Hunting Association of Ireland has a detailed code of conduct in place in respect of the hunting of foxes. I am disappointed that despite the existence of this code, this event occurred. I have asked my officials to engage with the Hunting Association to determine whether, in light of this event, the code needs updating. He said his department is fully committed to promoting good practices that respect the welfare of all animals. Evidence of breaches can be reported to the Animal Welfare Hotline operated by the department on 0761064408 or by email to animalwelfare@agriculture.gov.ie. Email “'It was gruesome': Fox torn apart by hunt hounds in the middle of Kerry housing estate ”. Feedback on “'It was gruesome': Fox torn apart by hunt hounds in the middle of Kerry housing estate ”.